When a film starts out with a crew of locals dredging a lake, you know you’re in for a treat. Penny Appleby (yes, really) anyway, Penny Appleby (Susan Strasberg) arrives by chauffeured limousine to the home of her estranged father in Nice, but is disappointed to learn that he’s away on business. Sure. He hasn’t seen his daughter in ten years and he chooses this exact time to leave town. Wheelchair-bound Penny immediately starts seeing her out-of-town dad sitting in chairs, slumped over in the pool house, and generally, dead. Oddly, these sightings prey on her mind. Soon Penny’s stepmother, Jane (Ann Todd) begins to suggest that Penny might need psychological help. This idea is approved by the omnipresent Dr. Pierre Gerrard (Christopher Lee with a French accent!). Penny’s not alone though. Robert, the chauffeur (Ronald Lewis) is drawn to Penny. At first, he feels sorry for the lonely girl, but as more suspicious things happen, Robert becomes Penny’s ally. The two amateur sleuths launch a clandestine investigation into the possible disappearance and probable death of her father. They also theorize on the reasons (money) that his death might work out well for certain people. Director, Seth Holt (The Nanny) builds tension and the script by Jimmy Sangster (Horror of Dracula) is spare and intelligent. 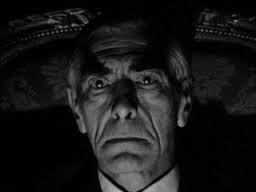 Cinematographer, Douglas Slocombe (The Servant), makes good use of darkness and candlelight and also does one of my favorite things…he waits. He and Holt let the actors do their thing and allow Sangster’s twisty story to unfurl. My one critique is Susan Strasberg. Yes, I know her dad is Hyman Roth and taught generations how to act. I just think he forgot to teach her. She’s shrill and you never really connect with her and that’s her fault. She’s the weak link in an otherwise superb thriller. Hammer Films made a number of thriller/mysteries along with the numerous horror films the studio is famous for. They’re not as well known as the gothic horrors, but they’re worth checking out. This is a good one. 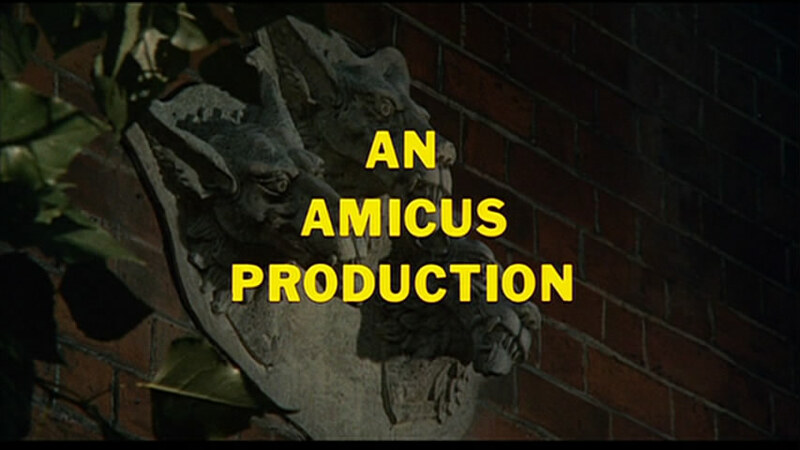 An English country house provides the setting for four Robert Bloch tales in the Amicus anthology film, THE HOUSE THAT DRIPPED BLOOD. 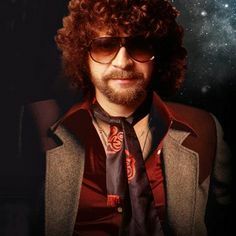 A.J. 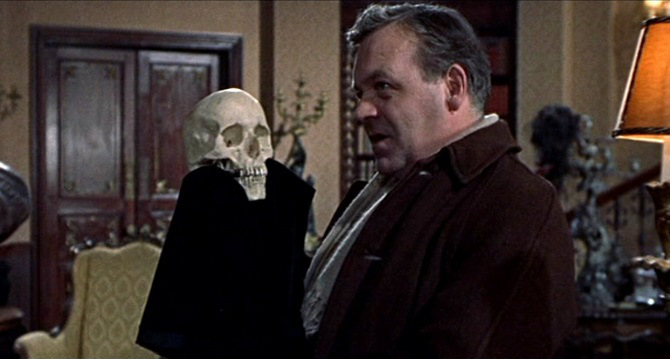 Stoker (John Bryans) explains to Detective Inspector Holloway (John Bennett) that the murders the detective wants to solve stem from an evil which dwells in the walls of the cottage. To prove his theory to the incredulous police officer, he tells four stories. 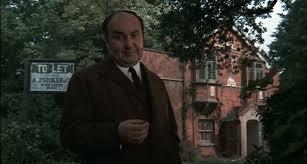 “Method for Murder” stars Denholm Elliott as Charles Hillyer, an author of murder mysteries who needs the peace and quiet of a country house to write. He and his wife, Alice (Joanna Dunham) move into the house so Charles can finish his book. Charles loves the house from the beginning. With bookshelves swollen with Edgar Allen Poe books and gothic bric-a-brac, he thinks the house will be the perfect cure for his writer’s block. He’s right. Soon, Charles’ creative juices flow and he creates a crazed killer to perform his literary evil deeds. When Charles thinks he sees this madman around his house, things go off the rails a bit. Elliott and Dunham play well together and the direction by Peter Duffell moves it along smartly. You know when you go into a rural wax museum and see a figure who looks like your ex? Me neither. 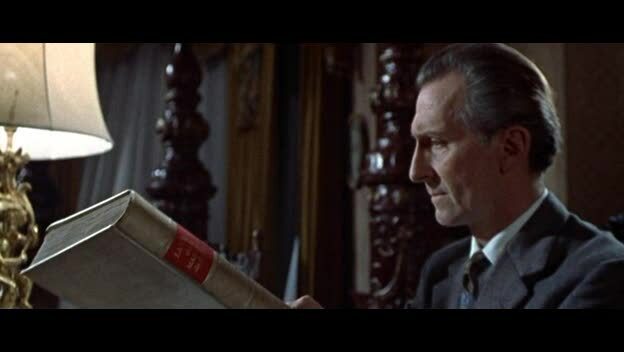 Philip Grayson (Peter Cushing) has worked hard all his life and amassed enough to live out the rest of it comfortably. He sees the house as a quiet spot where he can read and think. While strolling through the nearby village, Grayson sees a sign for Jacquelin’s Museum of Horror. Charmed by the thought of such a place out in the country, Grayson enters the shop. Unfortunately, all is not as it seems in the quaint museum. “Waxworks” also stars Joss Ackland as Neville, Grayson’s old friend, who also wanders into the shop. The two men become fixated on what they find there. They probably should have gone into the tea shop instead. 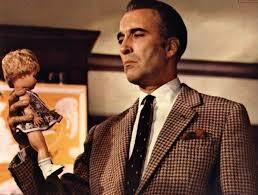 Christopher Lee looks sufficiently tweedy in “Sweets to the Sweet”. 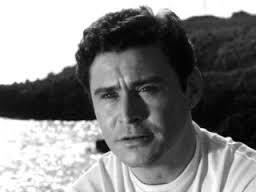 He plays John Reid, a successful businessman who moves out to the country house with his daughter, Jane (Chloe Franks). He doesn’t want to send the shy, troubled girl to school so he hires a private tutor, Ann Norton (Nyree Dawn Porter) to teach her at home. The teacher and child develop a bond almost immediately and Ann begins to wonder why Reid wants to keep Jane so isolated. The closer teacher and student get, the farther apart Reid and his daughter become. What’s the secret causing such tension? I’ll never tell. 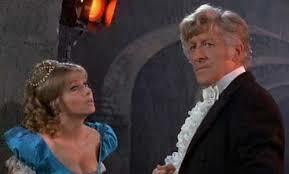 In “The Cloak”, Jon Pertwee plays Paul Henderson, a conceited movie star on the decline. Forced to appear in a low-budget vampire film, Henderson complains about everything from the script to the wardrobe. To introduce some authenticity into his role, Henderson heads to a costume shop and buys an old cloak. As soon as he puts it on, Henderson discovers the cloak is more than just a costume. 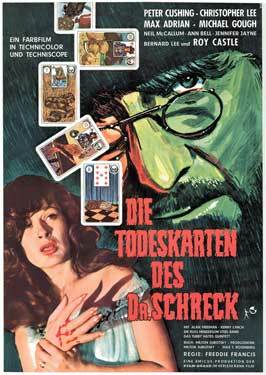 Ingrid Pitt also stars in this fun take on the horror film business. There’s also a cool in-joke. 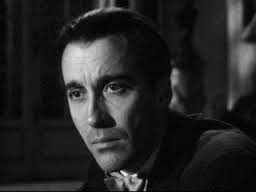 In an obvious reference to Christopher Lee, Henderson says he wants to play a vampire “…like Bela Lugosi, not this new fella.” I smiled all through The Cloak. 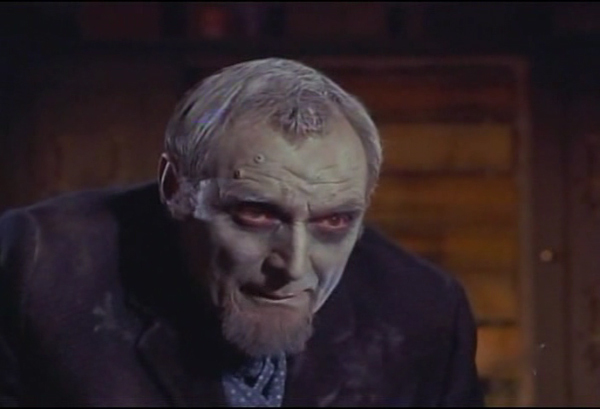 The whole cast, including Geoffrey Bayldon and an uncredited Joanna Lumley, worked well together. 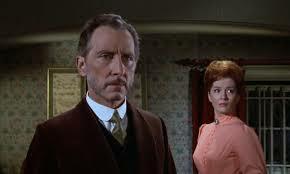 The writing, cast, and atmosphere in THE HOUSE THAT DRIPPED BLOOD keep you entertained and thinking. Fun flick. 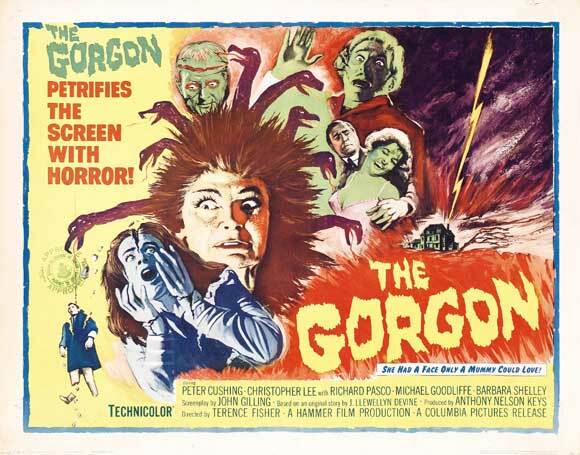 British horror films of the 1960s and 1970s have a certain macabre look to them. The lighting is dim and Gothic architecture and misty moors abound. The films also look similar because they often cast a veritable repertory company of actors. 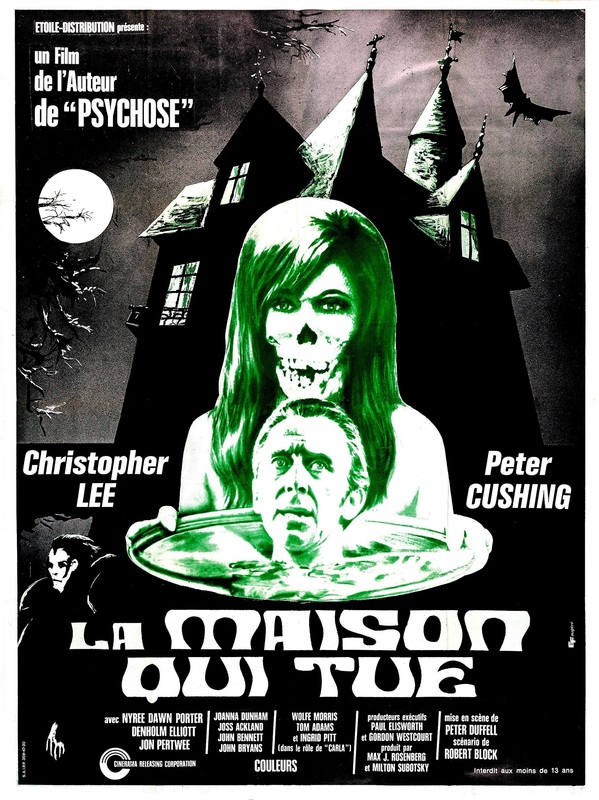 Christopher Lee, Peter Cushing, Michael Gough, Barbara Steele, Ingrid Pitt, Patrick Magee, and American actors like Vincent Price, Burgess Meredith, and Jack Palance often appeared in low-budget films made by Hammer or Amicus Productions. 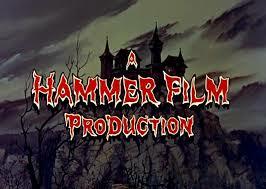 In Britain during that era, Hammer Productions was the largest and best known of the horror houses. Hammer Productions kept the legends of Frankenstein, Dracula, and the Mummy going long after Universal Studios had forgotten them. 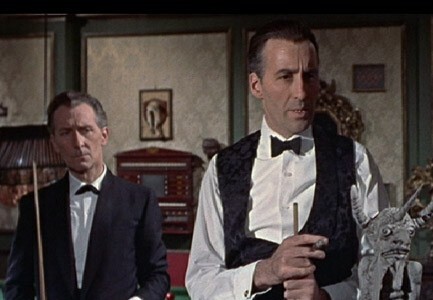 Hammer’s horror films often starred Lee and Cushing and that alone induced people to buy tickets. 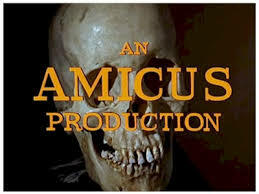 At the same time Hammer was running Van Helsing ragged, Amicus Productions was also making horror films. Though Amicus made full-length films like THE DEADLY BEES and THE SKULL, portmanteau horror movies like TALES FROM THE CRYPT gained that studio the most attention. 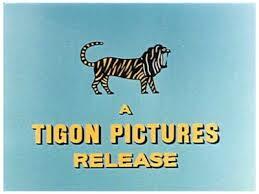 Competing with Hammer and Amicus and sharing office space at Hammer House in London, Tigon British Film Productions made fewer films, but often used the same actors, sets, and props as the other studios. That means you can see Lee and Cushing in Hammer’s SATANIC RITES OF DRACULA, Amicus’ VAULT OF HORROR, or Tigon’s THE CREEPING FLESH. Often directors like Freddie Francis, Peter Sasdy, Terence Fisher, and Roy Ward Baker shuttled back and forth between studios as well. All three studios showed a little gore and a little skin and all three were popular with audiences. Tigon cast its actors for 1968’s THE CRIMSON CULT or CURSE OF THE CRIMSON ALTAR from the Hammer/Amicus horror repertory company. Most of the actors had worked together in earlier films. 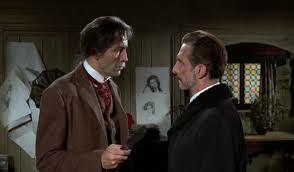 THE CRIMSON CULT leads Christopher Lee and Michael Gough appeared in films together including HORROR OF DRACULA for Hammer in 1958 and DR. TERROR’S HOUSE OF HORROR for Amicus in 1965. Lee and Boris Karloff starred in CORRIDORS OF BLOOD for MGM in 1958. Familiarity breeds comfort. The fact that these seasoned actors had already worked together allowed them to converse naturally on camera. The best scenes in the film feature the leads sharing a drink and a few barbs before a fire. 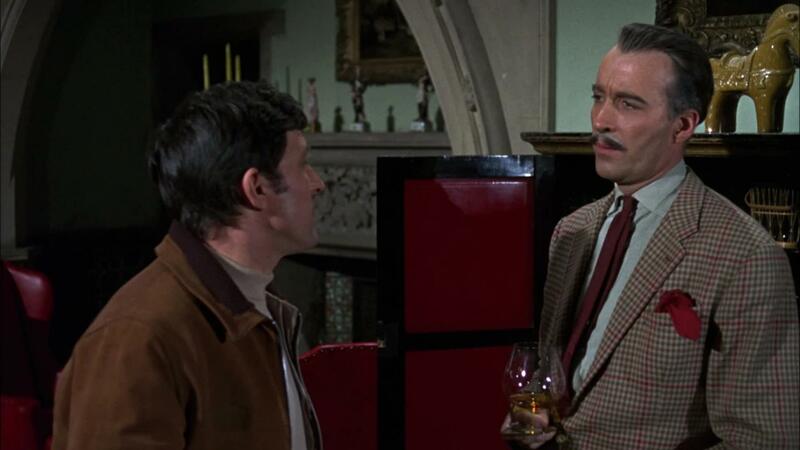 After his brother goes missing, Robert Manning (Mark Eden), antiques dealer and bon vivant, travels to Craxted Lodge in fictional Greymarsh to find him. The lodge’s owner, Morley (Christopher Lee) and his niece, Eve (Virginia Wetherell) invite Manning to stay at the lodge while he searches for his brother. There he meets friendly torture-device expert, Professor Marsh (Boris Karloff) and crabby Elder (Michael Gough). Naturally, Manning’s arrival coincides with the annual bacchanal commemorating the burning of an infamous witch in the village. Manning gets on well with Morley and even better with Eve. Wink wink nudge nudge. He has fun while he’s awake, but at night Manning has hallucinogenic nightmares involving ritual sacrifice and document-signing. 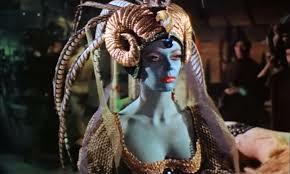 In his dreams, Lavinia Morley (Barbara Steele), an ancient witch sporting green makeup and horns, and her animal mask wearing cohorts try to force Manning to sign an ancient agreement. In his dreams, he fears signing the contract will mean losing his soul. 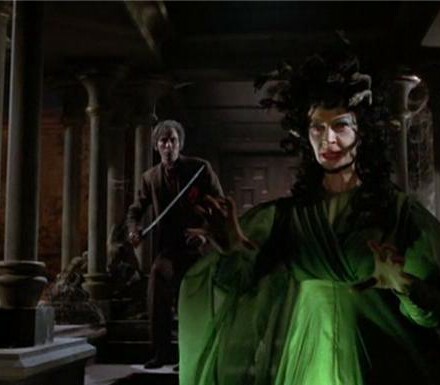 Later Manning stumbles upon secret passageways and an altar room, both of which figure prominently in Hammer films and his frightening dreams. With all the talk of contract signing, I couldn’t help thinking of other films in which the characters are coerced to ‘just sign here’. Manning’s dreams remind me of a psychedelic version of GLENGARRY GLEN ROSS, but with less coffee and more blood rituals. The interplay between Morley, Marsh, and Manning is my favorite part of the film. The screenplay by Mervyn Haisman and Henry Lincoln has enough witty banter for actors like Lee and Karloff to have fun with. As usual, Lee plays an erudite aristocrat who tells only enough to make you suspect him of something. 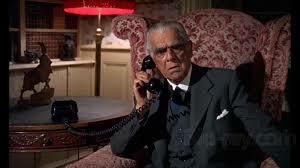 The looks and asides between him and Karloff are priceless. What about Marsh? Is he the crazed occultist invading Manning’s dreams? He does have a mysterious air and a weird hobby. Manning and Eve have real chemistry too and their mature love affair is a far cry from most of the American films released in 1968. 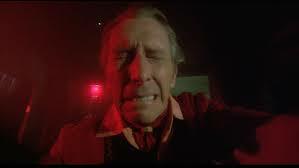 Vernon Sewell directed THE CRIMSON CULT and it looks as if he had a blast. The party scene, the witch-burning festival, and even the costumes suggest the film-makers were enjoying themselves. Still, a few questions remain. Will Manning find his wayward brother? Will he be able to resist the beautifully verdant, but evil Lavinia Morley? Will Manning stop chugging Professor Marsh’s fifty-year-old cognac like a teenager at a keg party? And finally, who will win the mellifluous voice contest, Karloff or Lee? THE CRIMSON CULT bears only a slight resemblance to H.P. Lovecraft’s story, THE DREAMS IN THE WITCH HOUSE. 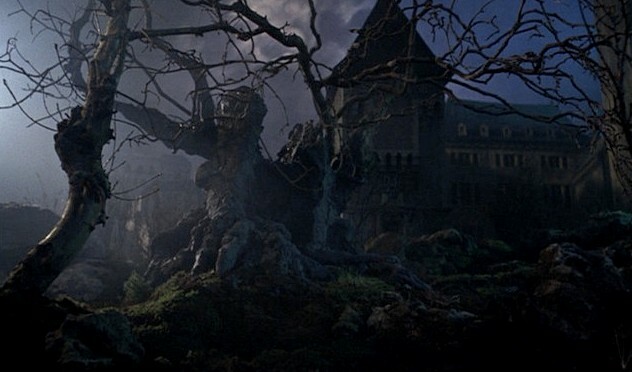 In that, a college student who studies math and folklore begins to have dreams of witches and child sacrifice while living in an accursed house in Lovecraft’s fictional Arkham, Massachusetts. The hero also dreams of traveling to other dimensions and meeting intelligent shapes. 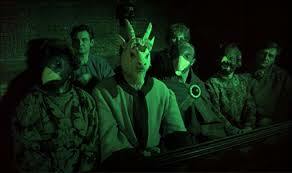 The filmmakers decided to stick with the more corporeal aspects of the story. 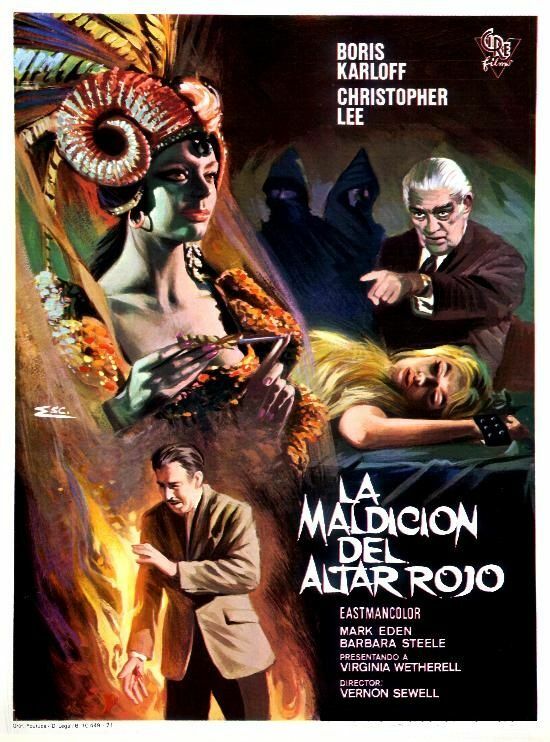 THE CRIMSON CULT’s distance from Miskatonic University matters less than the presence of Christopher Lee, Boris Karloff in one of his last roles, Barbara Steele with horns, and a weird party featuring guests drinking champagne off a woman’s body years before Salma Hayek did it in that Mexican vampire bar. 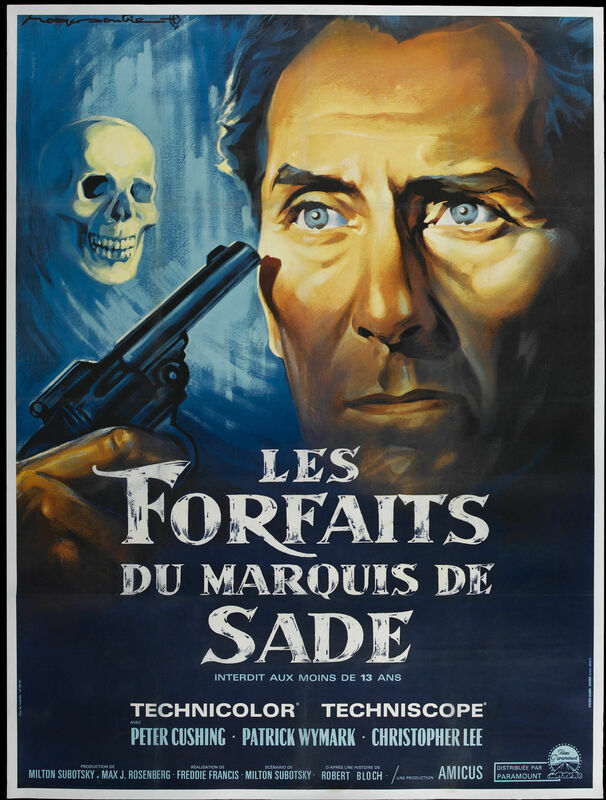 Despite the absence of Cthulhu or even Yog-Sothoth, THE CRIMSON CULT has enough secret doorways, plot twists, and Christopher Lee to make it fun to watch.